AT CITYBAR ESPRESSO, we’re as passionate about tea as we are about espresso. You are welcome to come upstairs any day to share in a few unique old methods, tastes and tea traditions with us. Our newly expanded upper level seating area is a great spot to enjoy a sit down moment, downtown on your own or with a friend. We’ve especially chosen a responsible tea supplier with over 30 years of experience and good trade practices. We didn’t want to just stock the most apparent flavours in tea pushing options, but rather keep it in kind with our conscious buying efforts. So, without further a due give a warm welcome to the Metropolitan Tea Company to our upper level. They offer the world, a world of tea and more. Run by an exceptionally passionate team of tea enthusiasts, Metropolitan Tea have very high expectations for the quality of their teas, and the conditions in which they are received. They’re a hands-on group who constantly travel around the world to check out processing factories, and to meet and talk with the harvesters who gather up our delicious teas. These guys love their tea, and will probably outstrip you in any discussion about how much they appreciate the warm and heady aromas of a solid blend. Besides having a stock list of their personal favourite blends, they know how good tea should taste, and they want to make sure that we get that same experience when we sit down with a steaming mug after a hard day. Ultimately, it’s an altruistic experience of tea lovers, who want to share the joys in a simple, yet heritage-rich beverage. From blacks, to greens and herbals, we’re fully stocked with the flavourful selections from Metropolitan Tea. Next time you’re in the neighborhood, we implore you to come upstairs and have a cup. We also have them in packages if you fancy taking some home with you, and we won’t blame you if you can’t resist! 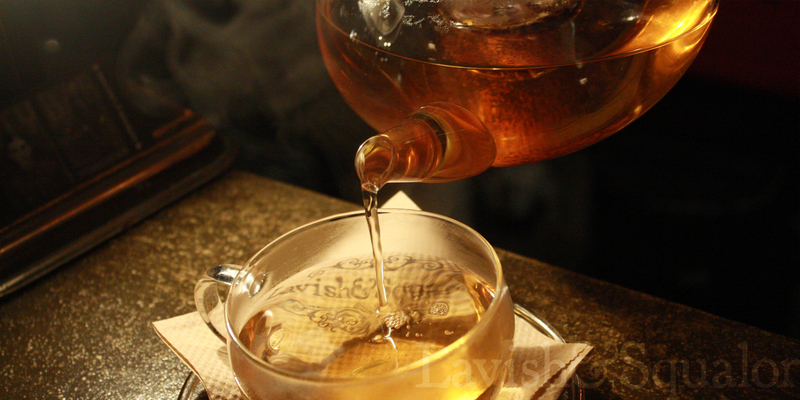 Meet upstairs for tea at Lavish&Squalor!